Fuels & Lubricants Archives on TDI related Fuels & Lubricants discussions. compu told me to post this here, rather than in fuels & lubes. A common question on TDIClub is, "what oil should I use?" The correct oil for your car is determined by which engine your car has, and what model year your car was manufactured. Please note that this thread only covers North American models, and only TDIs. Older indirect injection diesels are outside of the scope of this thread. Note that some owner's manuals from 1996 to 1999 allowed for 15W40 conventional oils, with API ratings as low as CD. Since those manuals have been printed, Technical Service Bulletins have been released superceding that information. An oil that is certified to the Volkswagen 505.01 specification is required. Oils that are certified to newer specifications such as Volkswagen 506.01 and 507.00 are also allowed. An oil that is certified to the Volkswagen 505.01 specification is required. Volkswagen of America recommends 507.00 in the newer vehicles, and is allowed in the 2004 V10 TDIs. 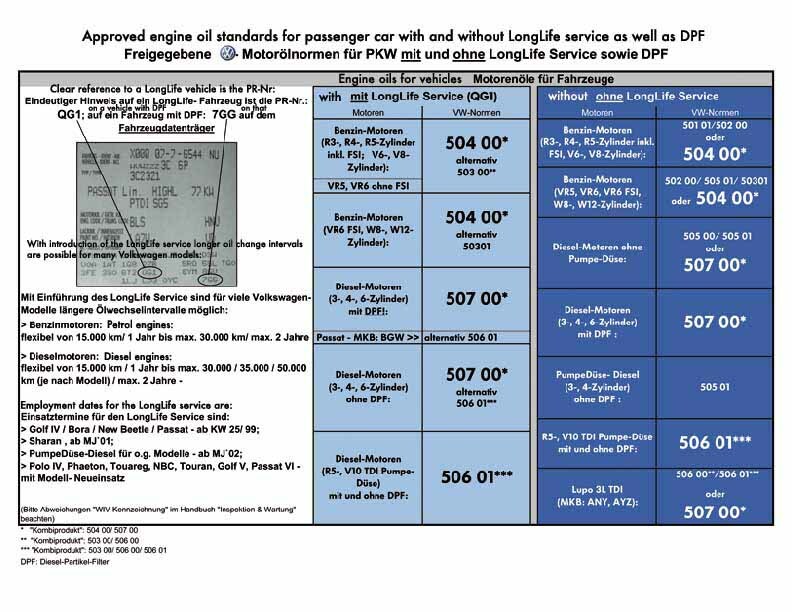 Volkswagen of America also allows 506.01 in all V10 TDI engines. However, Volkswagen Aktiengesellschaft (the parent company of VWoA) does not allow 507.00 in any V10 TDI. The really cool ToofTek made "Emperor's Clothes" injector fork risers only worked until someone pointed out that there wasn't any thing there. Last edited by bhtooefr; December 30th, 2007 at 08:39. E, there's no oil that can meet both API and the mfr's quality standard...it does not exist. Ah, my memory was bad. FWIW, that page about 502.00 only pertains to gasoline-engined cars. I've only ever heard of one case where a warranty claim was denied for running an API oil in a VE-TDI, and the owner forgot to bring his owner's manual with him to the arbitration hearing. Joe: Sticky? This thread's going to end up in the FAQ section. Last edited by bhtooefr; December 30th, 2007 at 07:20. Problem is, API has not produced an oil that can be used in a VW since '03. I don't see that fact changing any time soon. I'm using the above statement on "502.00" as it is applied across the entire product line regardless of engine. Use a compliant oil or don't come around asking for warranty coverage on protected components. Happy New Year, E ! Actually, it says "gasoline powered" in several places. Also, I edited the language a bit - for the 505.01 oils, changed it to "is certified to the 505.01 standard" from "meets the 505.01 standard." All times are GMT -7. The time now is 01:43.